Oxford Instruments M600 Helium Compressor Cryopump Cryogenics Freezing . New Life Scientific, Inc. This Helium Compressor in excellent cosmetic condition, and looks really clean and well cared for. It has been reviewed and tested by our technical staff and there is no known functional problems. Please refer to Technicians Notes for more details. This unit, along with the others we have, were removed from a plant in Phoenix, Arizona. They were set up for about a year, and then the plant shut down. They were in a very clean environment with great servicing by their in-house staff. We have 3 listings total for these units grouped together based on the hour usage. The first hour range is 700 to 1928 hours, the second is 2005-2897 hours and the third is 3070-3929 hours. This listing is for the 3070-3929 hour range. We can only guarantee that the hours on the one you receive is in the range stated. The one pictured may not be the one you receive. All of the compressors are 3 phase High voltage. You may also contact us about quantity discounts. Parts and accessories for this system are still readily available and this unit is still supported by the manufacture. Each compressor we sell comes with a 90-day, full coverage warranty. If you have any problems with your compressor in the first 90 days we will either repair or replace the compressor at no cost to you. 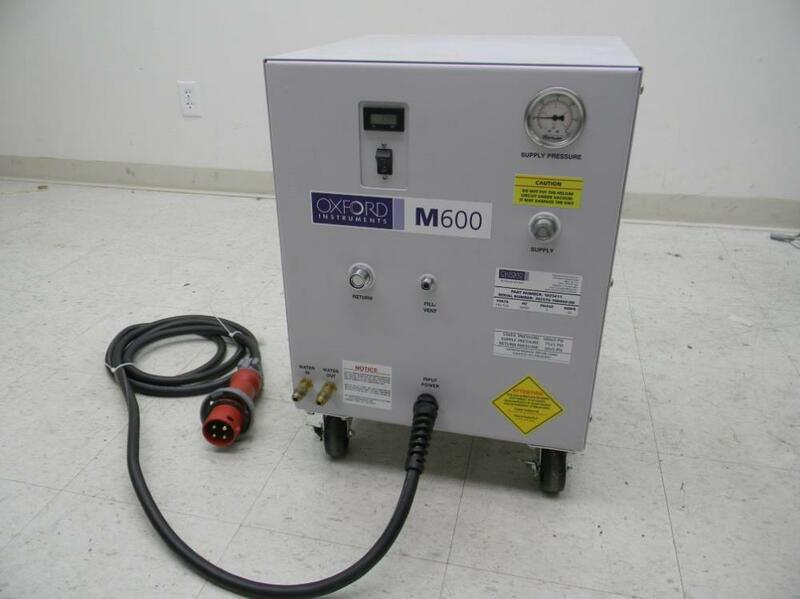 We received the Oxford Instruments M600 Helium Compressor into our shop on 9/20/2015. We inspected all of the electrical connections and connector cables. We verified all of the component power requirements. We supplied power to the unit and observed compressor running without any issues arising. We ran this unit for a very short period because we do not have any cooling heads to hook to it. Unit was then removed from the tech shop and set up for final photography.